I turned 40. That was weird. I revisited State College, Pennsylvania, where I used to live thirteen years ago. That was weirder. My parents got a new dog, Finn. So by extension I got him too. One of my uncles passed away. He was 83. I went to Florida. I went to Paris. I went to Finland. I went to Charlottesville. I went to San Antonio. I liked all of those places. I published three short stories, including one I sold over a year ago. I read 339 short stories. That’s not bad, but less than in years past. I read 25 books. That’s better than I thought, to be honest, and a little up from recent years. But I still like to be reading more. And that was 2017. Nothing of any other consequence happened that year. Nope, no sir. 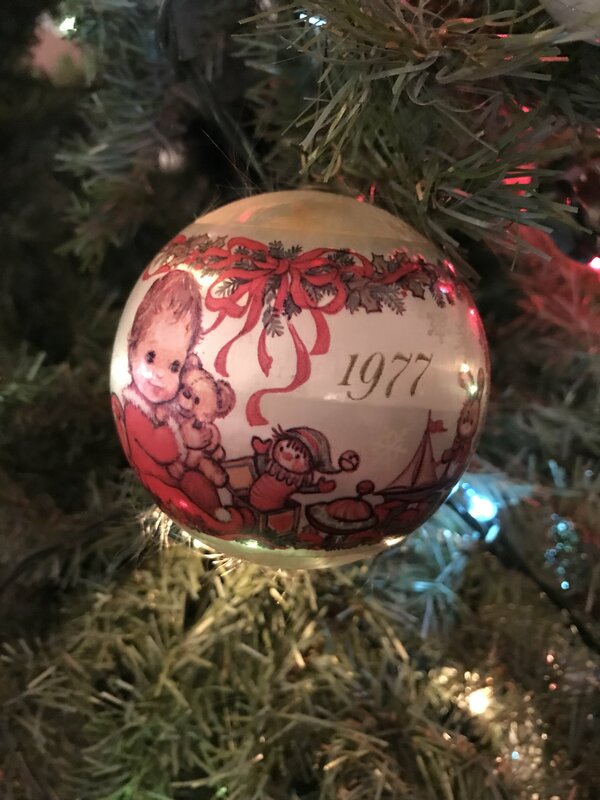 So yeah, obviously things were kind of a mess globally, politically–and will likely continue to be so for some time–but things were also fairly okay personally. I’ve had better years, maybe, but I’ve had worse. I’m hopeful for 2018. Partly because…well, you’ve gotta be. But I really do think it’s going to be a better year. In 2015, with no real plan or expectations in mind, I set myself the New Year’s resolution of reading a short story every day. I wanted to be more involved in the field of short fiction, and better aware of what was going on at different markets (other than my own). Also, if you’re going to try to write short fiction, you should really do yourself a favor and try to read some of it too. For the past two years, I’ve been pretty good about keeping to the resolution. I miss some days, and some days I forget to write down whichever story I’ve read. But altogether this year, I read at least 339 short stories, which isn’t half bad. And moreover I really liked about half of them. That’s not say the other half were bad stories–those happen, but they’re mercifully rare–but these 151 were my favorites. Just going by the numbers, for me the top three venues were Uncanny, Lightspeed, and Escape Pod, while the authors whose names appeared most often were A. Merc Rustad, A.C. Wise, and Adam-Troy Castro. December was an uneventful month. Some busyness at work before the holidays, then the holidays themselves. I had some back pain and a short story rejection on Christmas itself, but the holiday season was quite lovely and relaxing. And I had two stories publish in December, so there’s always that. My flash story “Terrible Lizards” appeared in Everyday Fiction, while a longer story I sold a little over a year ago, “The Northern Recess,” appeared in Stupefying Stories. I’m really happy with both sales and hope people enjoy the stories. Other than that, it was mostly just the usual assortment of books, short stories, movies, and music. I read it for my book club, and I mostly liked it. I watched 29 movies in December. What can I say? I had some free time around the holidays. Local Hero is amiable but very aimless. The Bad Batch has some moments and visual flair, but it’s so goddamn slow and yet barely even registers as a story. Logan Lucky is a lot of smart dumb fun. 1922…was not a particularly good year. Yeah, Split is an awful movie. Part of what works about Gone Girl—small spoiler—is how well Gillian Flynn tricks you. Watching someone recreate that trick, even someone as interesting a filmmaker as David Fincher? I just don’t know. The Autopsy of Jane Doe wasn't bad, though better and scarier at the beginning than at the end. Working Girl is actually a pretty good movie. A little dated in spots, but the cast is good. 9 to 5 is a little dumb in spots, and certainly a touch dated, but its three leads are awfully winning. Tucker & Dale vs. Evil is a one-joke movie, but it's a pretty well-told joke. Daughters of Darkness is a strange horror movie. Gorgeously shot, with a sinister performance by Delphine Seyrig, but kind of unsatisfying. Stronger was very good. Gyllenhaal and Maslany are both terrific in it. You know, aside from the fact that I'll never experience joy in my life I don't think Hellraiser II had any kind of negative effect on me. Even at The X-Files’ worst, Anderson and Duchovny are great with one another. Curtis and Poitier are pretty damn terrific in The Defiant Ones. Her is sweet and quirky in all the ways I’ve come to expect (and even delight in) from a Spike Jonze movie. But it’s also maybe a little too enamored of its own aesthetic to have anything of deep consequence to say about human relationships. Pottersville thinks it’s heartwarming and funny and maybe even subversive, but boy howdy is it just bad. Michael Shannon particularly seems lost. It has some interesting shots masquerading as narrative and well-chosen affectations masquerading as character, but it's not very enjoyable, nor does it really have a lot to SAY about the dilemma it sets up. I don’t think there was this much gaslighting in the actual movie Gas Light. I don’t think there were this many religious overtones in the actual Bible. Lake Mungo was not what I was expecting. It’s very spooky in parts, and very carefully constructed, although also a little disappointing. Eagle vs Shark feels like lesser Waititi, but it’s strangely very endearing. A Ghost Story requires considerable patience—and I’m not sure it rewards every last ounce of it—but it’s a touching meditation on grief and love and letting go. I was going to say I didn’t quite love 20th Century Women, but I think I liked it so much that I learned to love it. While Marjorie Prime is maybe not amazing–and is more like a good (and somehow not depressing) Black Mirror episode–the cast is quite good. I really liked Barry Lyndon. But boy howdy is the second half different than the first. I’ve been meaning to get around to this blog post for about half a month now. On the very off chance that anyone else but me has been waiting for it, my apologies. I went to World Fantasy at the top of November and managed somehow to not meet up with, or even pretty much say hello to, anybody. 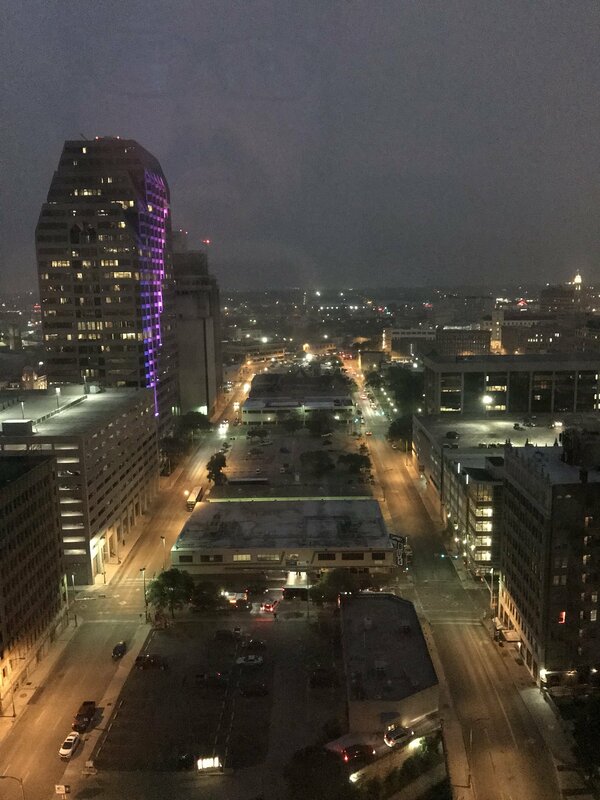 I did have dinner with my sister one evening, and got to see some of San Antonio–which I really didn’t get to do the last time I was there–so that was nice. And the con itself was pretty good, some good readings and mostly good panels. Otherwise, though, November was a fairly uneventful month, Thanksgiving notwithstanding. I read some books and some stories, saw some movies, and listened to some music. My usual. People say werewolves are animals, but they’re wrong. We’re so much worse. We’re people, but with claws, with teeth, with lungs that can go for two days, legs that can eat up counties. The Last Detail is pretty good. Nicholson in particular gives a really great performance. I mean, of all the movies where Die Antwoord teach over-eager police robots to be gangsters, Chappie is definitely one of them. It’s a typical Marvel movie, if made with more color and humor and charm than most. I think I am starting to understand why I never saw this movie, despite having grown up in the '80s. I’m not sure if I really loved Atomic Blonde—it maybe leans a little too heavy on its style and soundtrack—but it does often look great, and Theron is quite good in it. Nocturnal Animals is a deeply unsettling, confusing, strangely affecting yet also curiously aloof movie. War for the Planet of the Apes is okay. It has some decent ideas, and like its predecessors impressive CGI. But it also has some pacing issues and never really came alive for me. The Right Stuff isn’t bad. It gets a little goofy sometimes, and I don’t know if it would be better or worse if it wasn’t trying to tell such a big story, but it has a strong cast and is well made. I can’t believe it’s taken me this many years to watch Schindler’s List. It’s an incredibly powerful film, easily one of Spielberg’s best. Hunt for the Wilderpeople isn’t the most laugh-out-loud of Taika Waititi’s movies, but his sensibility is all over it. The movie is weirdly sweet, and Sam Neill’s really good in it. The Conjuring 2 has a few scary moments, and it looks well made, but I actually liked it less than the first one, which I didn't really like. It has a good cast, but I am not really enjoying the empty exercise that is The Big Chill. Yeah, I think this Spielberg kid might have something. It’s almost two weeks into November, so I should probably write about what happened in October, right? Except, I don’t think anybody but me is really reading this…and not much actually happened in October. I mean, I went to Charlottesville, Virginia, for work. 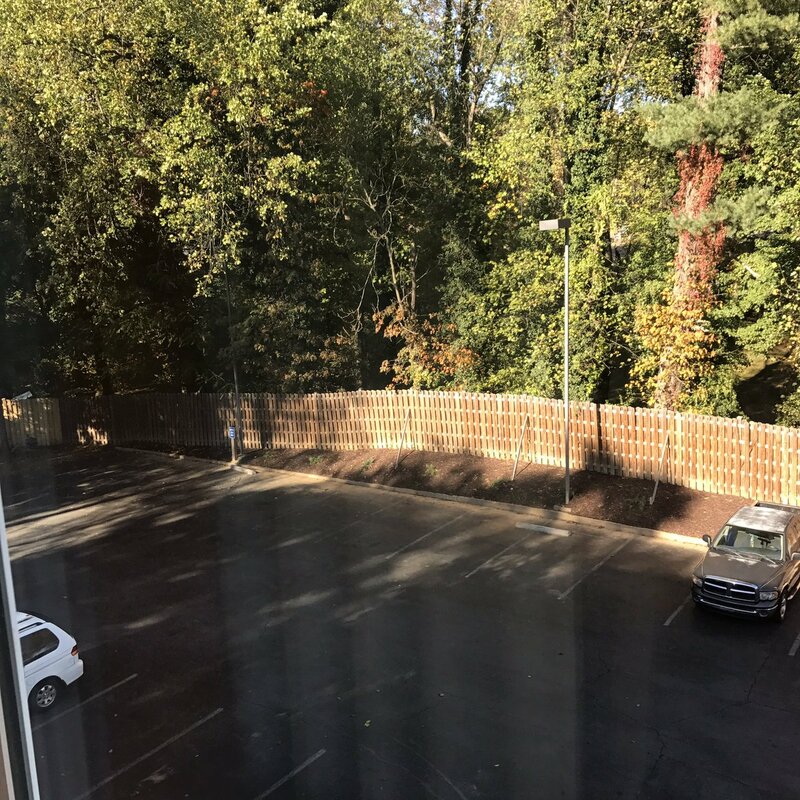 That’s one of the only photos I have from my trip, unfortunately–the parking lot as seen from my hotel room–even though the grounds of the University of Virginia are pretty enough, and the weather was very pleasant while I was there. I spent a considerable number of hours in the tiny Charlottesville airport–I sneezed, and someone across the terminal said god bless you–but I also got to meet a Twitter friend who lives in town, so that was nice. But aside from that, and house-sitting at the start of the month–when it was just me and the dog, while my parents were on a trip abroad–October was pretty uneventful. I didn’t even finish reading any books. I did read some short stories, though. I watched some movies. And I listened to some music. That’s it, really. It's not my favorite Scorcese movie, but it's well made, with some good performances by Daniel Day Lewis and Michelle Pfeiffer. It's hard to just watch Thelma & Louise as a movie, much less for the first time, more than two decades later. I liked some of it, though. Like every other Denis Villeneuve film I've seen, Blade Runner 2049 is thoughtful, poetic, beautiful, intriguing, and a little ponderous. I don't think I'd call Gerald's Game a great movie, but it's pretty good, thanks mostly to Carla Gugino's strong performance. Serpico is maybe just a little unsatisfying story-wise, but Pacino's very compelling in the title role. That was pretty delightful. Jessica Williams should be in all the things. This movie's a little slow, but it does have the late great Harry Dean Stanton in an eyepatch. Rabid isn't wholly terrible, but I feel like Cronenberg got at the sort of body horror ideas in it much better in later films. Blacula has some surprisingly resonant themes and a decent lead performance. It's better than its title. It's just not a very good movie. I don't know if The China Syndrome is a great movie, but it has a great cast and it's well made. The Elephant Man was pretty good. It's interesting to see Lynch's techniques applied to what's a relatively straightforward story. Not-Quite-as-Goodfellas is right, as it turns out. Casino has a lot to recommend it, but in the end it’s more exhausting than anything.